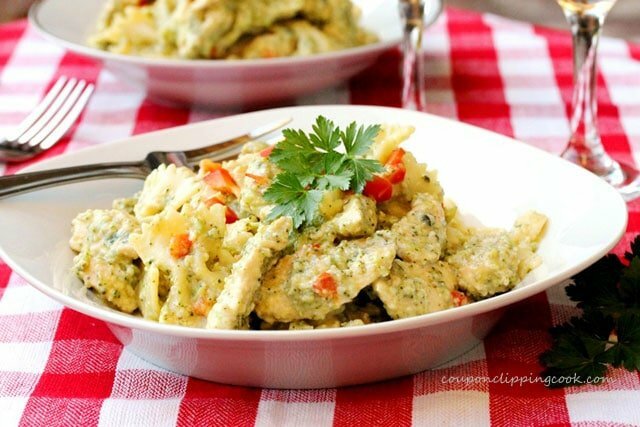 An incredibly delicious one-skillet meal that will have you coming back for more. 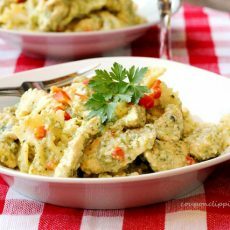 This quick and easy one-skillet meal tastes wonderful and is light but also filling at the same time. 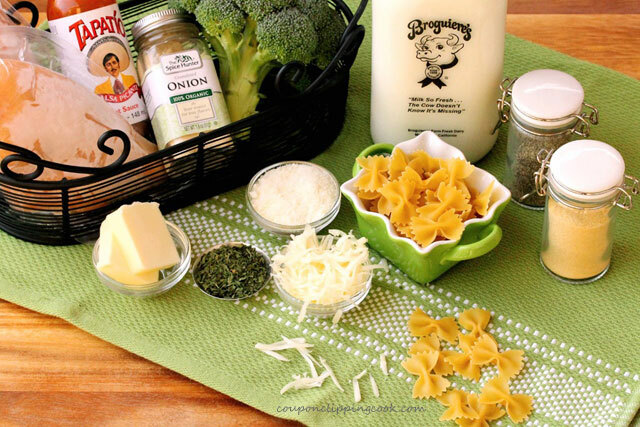 The broccoli actually becomes part of the sauce and after it’s mixed in with Parmesan and mozzarella cheese, the taste resembles that of cream of broccoli soup. 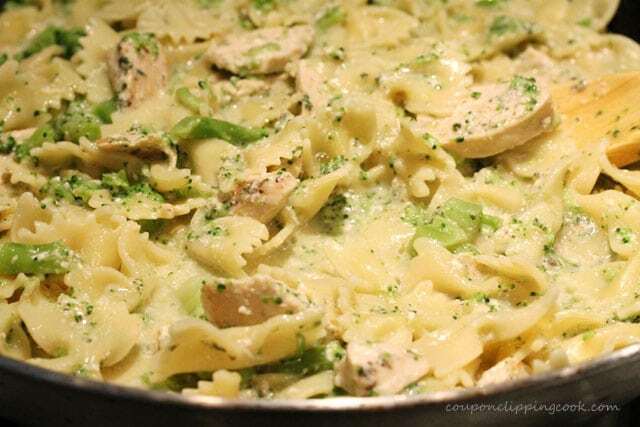 I love one-skillet meals because everything is mixed together and you can taste it all in one bite. And, an added bonus is that there are less dishes to wash which is a good thing. 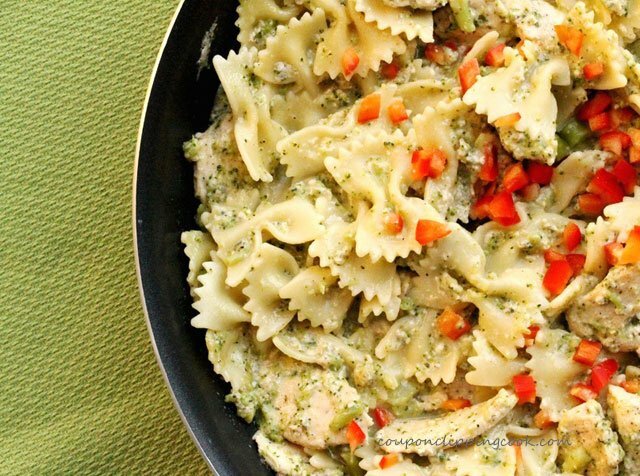 Bow tie pasta is used in this recipe which adds a light heartiness to the dish. 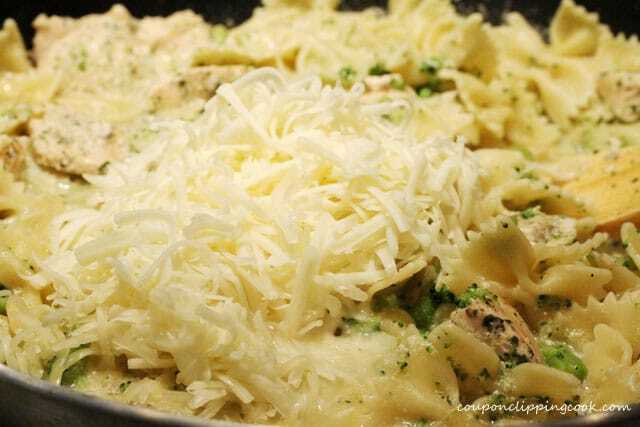 The pasta is especially delicious when it’s cooked al-dente so that its firm enough to stand up to the chicken when mixed together. 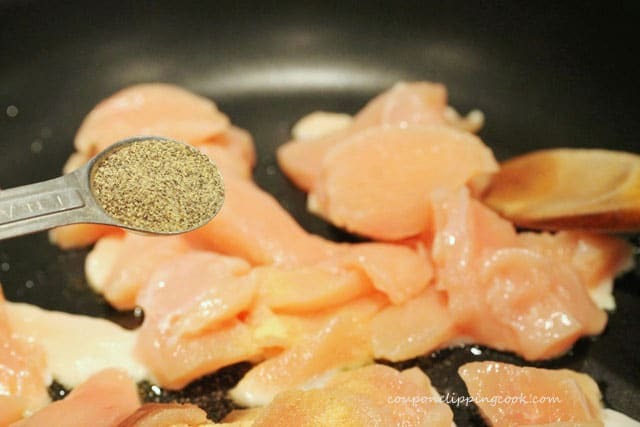 For the chicken, a boneless skinless chicken breast is used. When it comes to quick and easy dinners, thank goodness for frozen chicken breasts. They are so handy to have on hand for spur of the moment meals like these…”Nut-Crusted Coconut Chicken with Peanut Sauce“, “Easy Barbecue Chicken with Rice“, “Fried Chicken and Bacon Gravy Sliders” and “Easy Chicken with Black Beans“. I like the frozen skinless chicken breasts that are individually wrapped and come in a big bag. They’re often available at Costco. 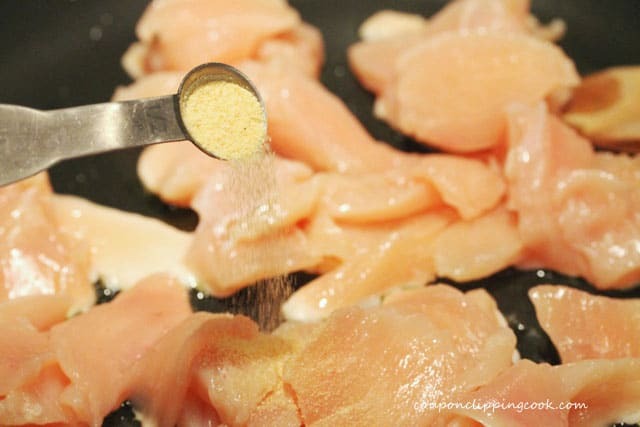 I’ve mistakenly bought bagged frozen chicken breasts in that past that weren’t individually wrapped and found that they stick together which makes it hard pick out just one chicken breast at a time. Cut the florets off of the broccoli stalk. And cut the stalk into small pieces. 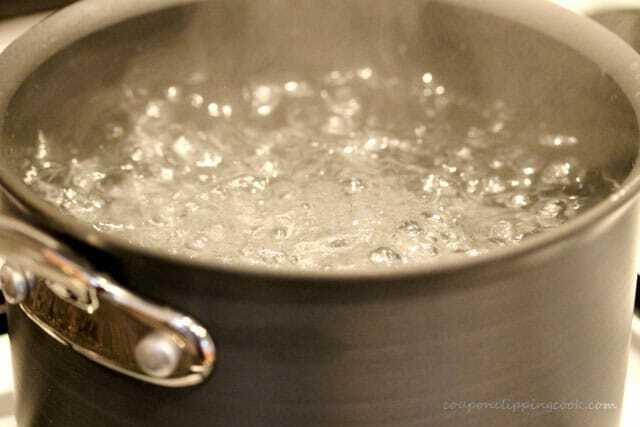 In a medium size pot, add water and salt. Bring the water to a boil. 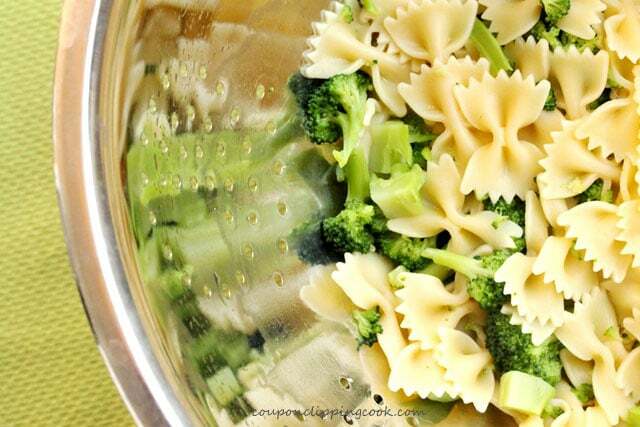 Cook the pasta while stirring occasionally for 4 minutes and then add the broccoli. Cook until the pasta is al dente according to package instructions. 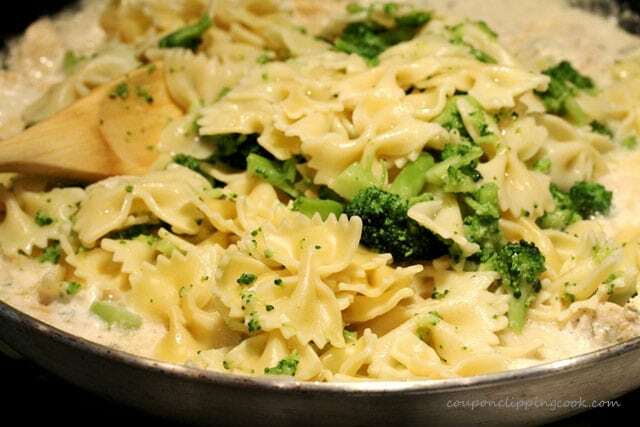 Then strain both the pasta and broccoli and set aside. 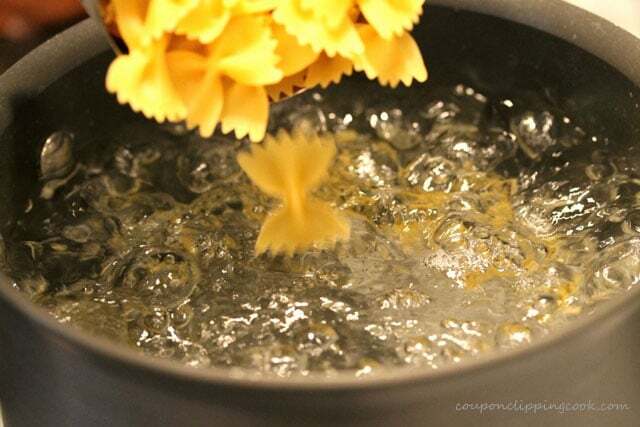 TIP – Don’t rinse the pasta after cooking it. When pasta is rinsed, the starch is removed. The starch on pasta helps to hold and absorb the sauce so it’s important to keep the starch on the pasta. 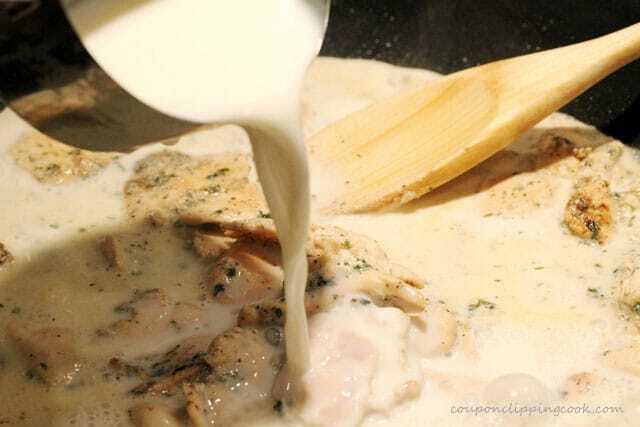 Also, the starch will help thicken the creamy cheese sauce when it’s mixed in with the dish. Cut the chicken into bite size pieces and set aside for just a moment. Set the milk for this recipe on the kitchen counter for 3 minutes before using it so that it will be at room temperature when used in the steps below. 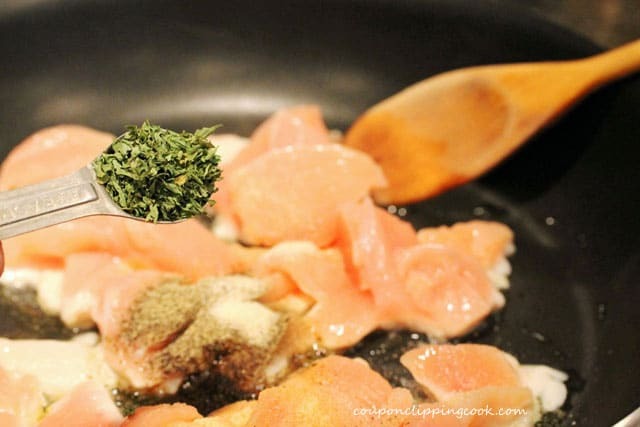 Stir the chicken, spices and herbs together. 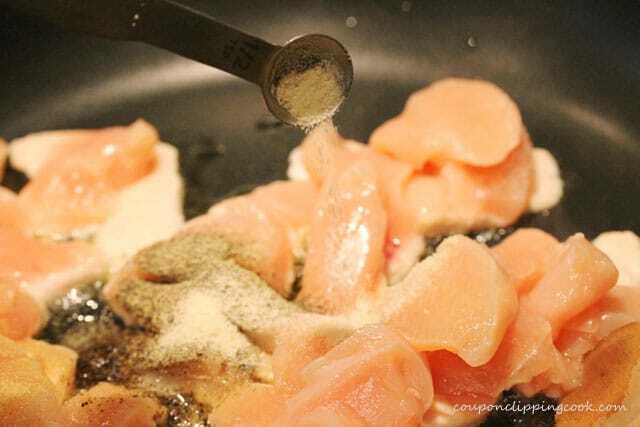 Continue cooking until the chicken is thoroughly cooked starts to brown (5 – 7 minutes). 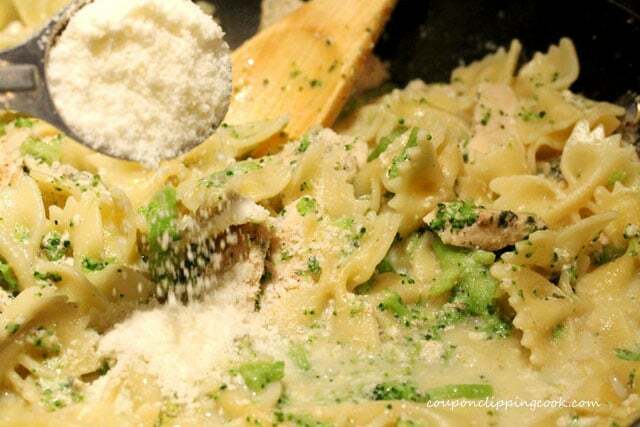 Add the cooked pasta and broccoli. Stir together and let simmer until the milk reduces (about 3 minutes). …and garnish with diced red bell peppers. 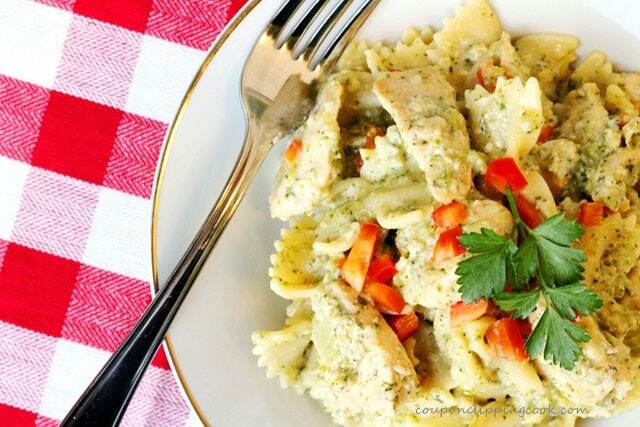 An incredible delicious one-skillet meal that will have you coming back for more. Cut the florets off of the broccoli stalk and cut the stalk into small pieces. Set aside. In a medium size pan, add water and salt. Bring to a boil and add bow tie pasta. 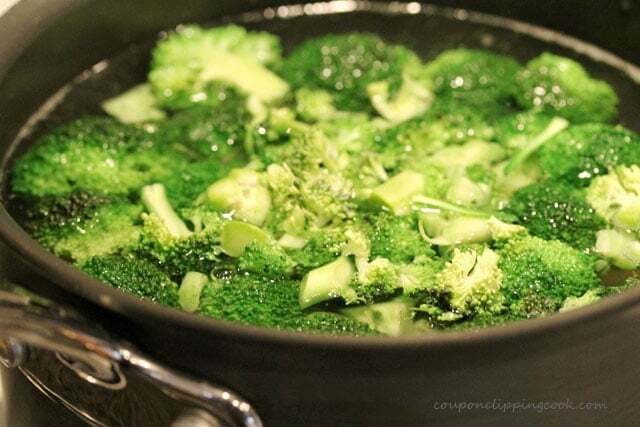 After 4 minutes, add the broccoli. Cook until the pasta is al dente according to the package directions. 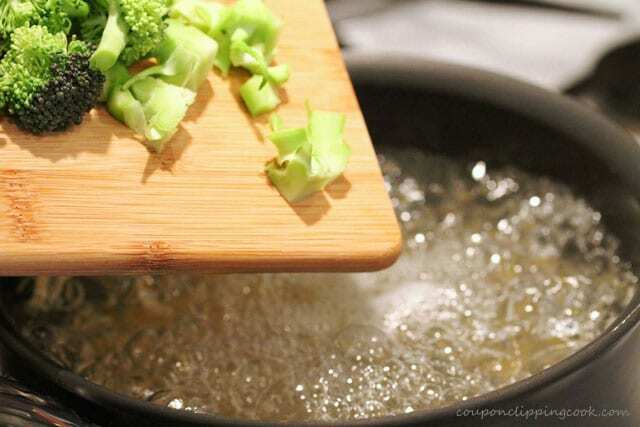 Strain the pasta and broccoli (don't rinse) and set aside. Heat a large skillet on medium heat and add olive oil. 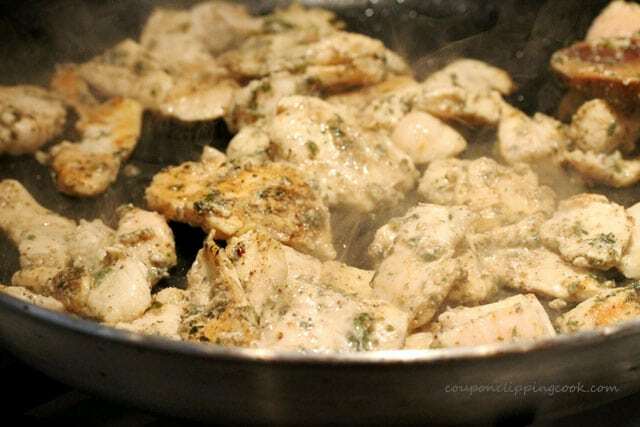 To the pan, add the chicken, granulated garlic, pepper, onion powder, dried parsley and salt. 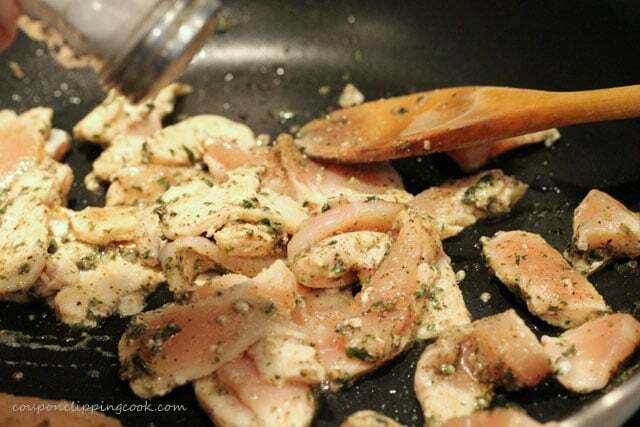 Stir the chicken, spice and herbs together. Continue cooking the chicken until it is thoroughly cooked and starts to brown (5 to 7 minutes in total). 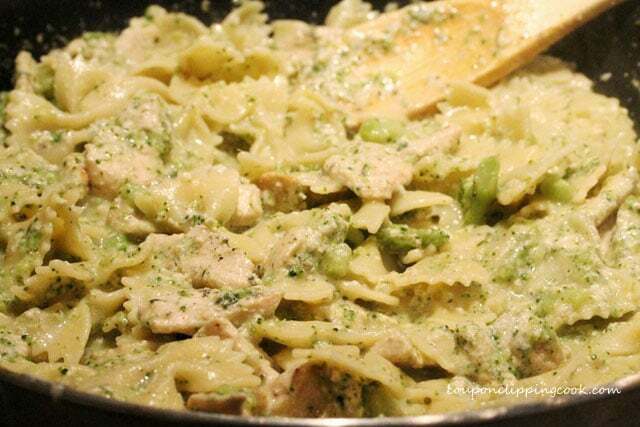 To the pan with the chicken, add butter, milk (at room temperature), hot sauce, and the cooked pasta and broccoli. Stir all ingredients together. A the Parmesan and mozzarella cheese. 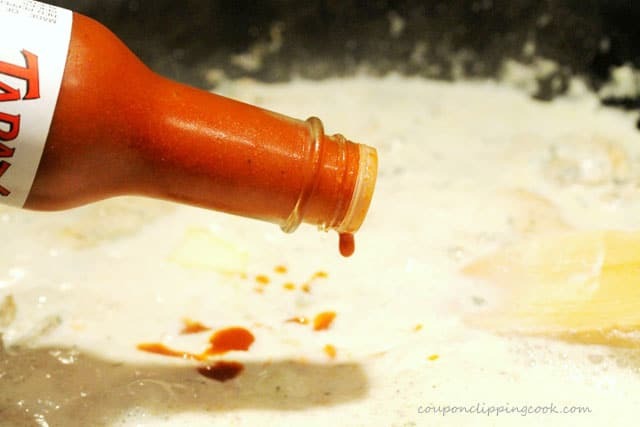 Stir together and let simmer until the milk reduces just enough for the sauce to thicken (about 4 minutes). Serve hot warm out of the pan and garnish with diced red bell peppers. Don't rinse the pasta after cooking it. When pasta is rinsed, the starch is removed. The starch on pasta helps to hold and absorb the sauce so it's important to keep the starch on the pasta. Also, the starch will help thicken the creamy cheese sauce when it's mixed in with the dish. Sad, mine looks like water with added cottage cheese! Where did I go wrong? Hi There, it sounds like the sauce didn’t thicken enough. 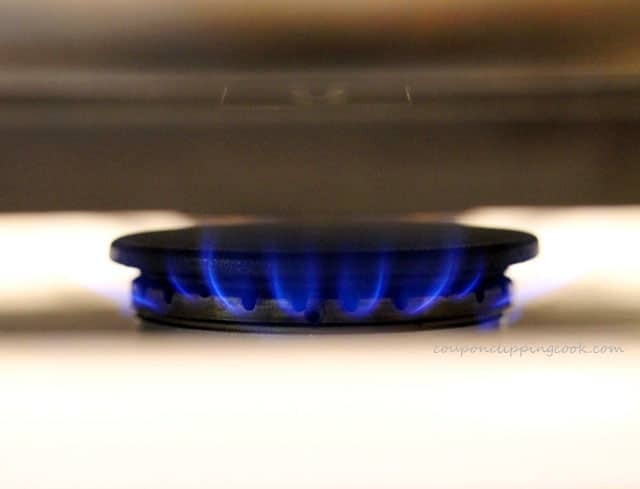 An option may be to let it simmer just a bit longer until the milk cooks down more. The starch from the pasta should also help to thicken it. I’ve had this problem before when using nonfat milk; using regular milk may also help. I hope this works out for you next time. Thank you for stopping by and have a wonderful weekend! 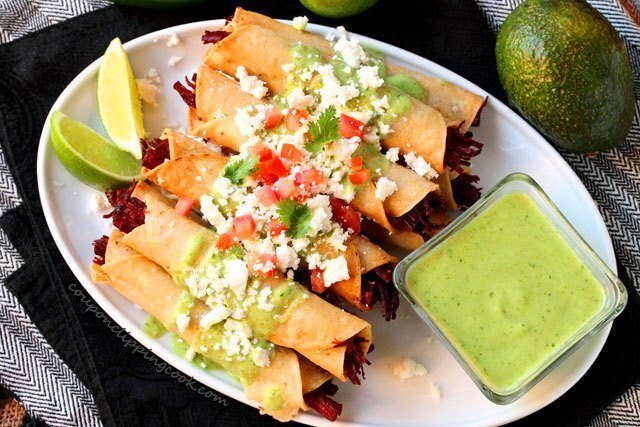 This recipe looks delicious and simple. I’m going to add it to my week night menu. thanks! Hi Jennie, thank you and let me know how you like it. Thank you for stopping by! I’m so glad I found this recipe on Pinterest. My picky eaters really loved it! They even asked for seconds. Thank you for sharing this wonderful, easy to follow recipe! Hi Marjorie, that’s great news! 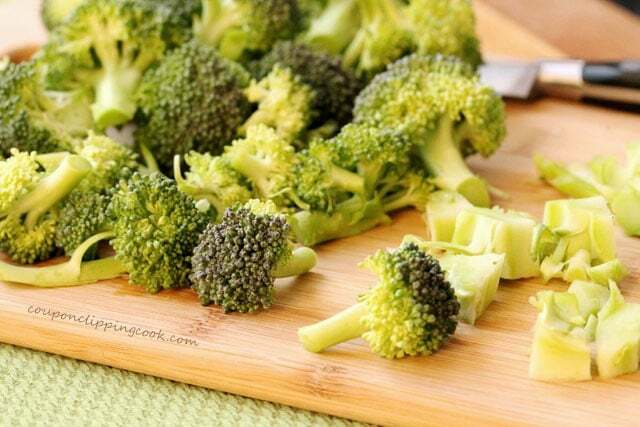 It’s a good dish for sneaking in some broccoli. I think more mozzarella sounds delicious!!! Thank you for letting me know how it turned out! Hi Sarah, thank you for letting me know about how this recipe turned out for you. Another person who commented mentioned that she doubled the spices in the meat which sounded good to me too. Maybe that plus a bit more salt would help for your palate….I totally know what you mean about wanting more butter for this! So did I but I kept trying to hold back as much as possible to hold down the calories….but the more butter the better as far as I’m concerned! Thank you for the feedback! I made this for dinner last night and it was really good. I actually doubled the spices on the chicken and added more salt and pepper to the sauce, and it was yummy and great for a cold night. The sauce took a while to reduce down, so I wish I had made more pasta, but I’ll keep that in mind for next time. I skipped the red pepper and didn’t think it would make much difference either way. I’d make this again. Your changes to the recipe sound delicious. So good to know you added more salt and pepper too…sometimes I wonder if I like more salt than others may like so sometimes I hold back on the salt a bit. So good to hear the feedback and that you would make this again. Have a great rest of the week! You’re right, it had that taste of comfort food. Maybe it was the taste of broccoli mixed in with everything else. Have a great day! I made this dish yesterday, and it was very yummy and comforting. I used half skim and half whole milk to lower the fat content. I also used orecchiette. Lastly, I used a cornstarch slurry to make the sauce thicker. Next time I’m going to try to make it even lower in fat by using brown rice or homemade wheat pasta along with all skim milk plus the cornstarch slurry. Thank you so much for sharing this yummy recipe and the process photos! 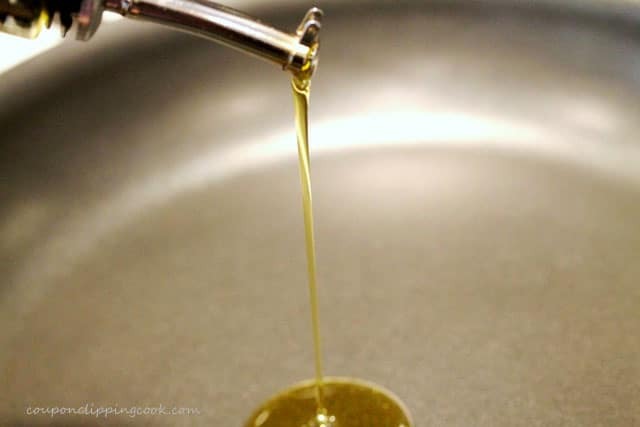 Love all of the changes you made…they sound delicious and an added bonus is the lower fat content. So glad you liked this recipe and using brown rice is such a good idea. I’m going to try that next. Thank you for letting me know how it turned out. Have a great day! Mmmm! I’ll definitely be trying this out, looks delicious! Hi Jen, thank you. Have a nice weekend!